This is my online, introduction to the geography of Russia that is meant to accompany my HIS 241 and HIS 242 courses. On this web page, I have some general remarks about Russia's geography. Below on the page are links to two interactive maps of Russia; one requires the use of a "Flash" plug-in; the other does not. On either map, you will find links to some specific geographic features of Russia, such as the Ural Mountains. By following any link, you will find additional information on that geographic feature. Please note that most of these web pages are designed for a monitor display of 1024x768. The pages will also display on an 800x600 screen, but you will have to do some horizontal scrolling. First, remember that I have loosely defined "Russia," for the purposes of HIS 241 and HIS 242, as roughly corresponding to the boundaries of the former Soviet Union of the 1980s--old habits die hard. Having said that, there is no other way around it, Russia, the largest "country" in the world, is big, very big, comprising roughly 1/6th of the world's land mass. From east to west, it spans eleven time zones and over 5,700 miles--the distance from St. Petersburg to Vladivostok is even longer, over 6,000 miles. 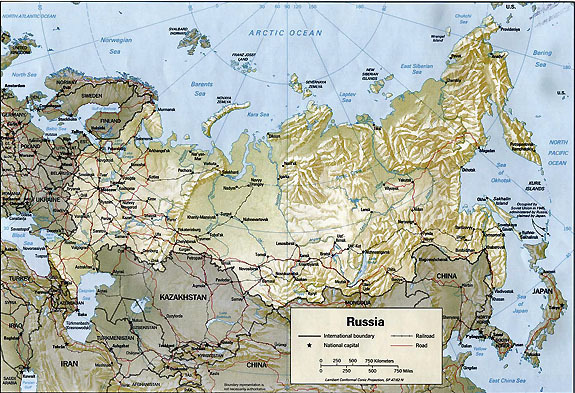 From south to north, Russia spans about 40° latitude (42° to 82°), a distance of over 2,500 miles. Russia is primarily a "northern" country, with most of Russia located above 50° latitude--St. Petersburg is roughly the same latitude as Anchorage, Alaska. Thus, Russia tends to resemble Canada more so than the United States in terms of climate. This means that the agricultural growing season tends to be short, limiting the types of crops that can be grown. Most of the land consists of vast plains: steppe to the south, taiga in the center; tundra to the north. This vast Eurasian plain, stretching from the Pacific Coast all the way into Central Europe, is broken only by the Ural Mountains in the middle--mountains that because of their low height have never really been a barrier to travel or invasion. There are mountain ranges along the southern border of Russia. Although Russia possesses a very long coastline--mostly along the north--it's overall climate is primarily "continental" because most of its large land mass is away from the moderating influence of the sea. The generally long, cold winters of the continental climate have affected where the people have settled, what they can grow, and what they can build. Since Russia is very large, communication has always been a problem, and something that very much contributed to the long process of creating a centralized state. Most rivers flow north and south and thus are problematic for east-west communication purposes, which is the way that the country is generally oriented. Technically, Russia is no longer a "land-locked" country with ports on the Baltic, Arctic and Black Seas, but it took the country a long time, and a lot of efforts, to acquire those harbors. Russia is a country very much endowed with rich natural resources, such as coal, iron, oil, natural gas, gold, minerals. All of that helped to make the Soviet Union an industrial power. Finally, throughout my remarks on Russian geography, I sometimes refer to "biomes." A biome is a large geographical area of distinctive plant and animal groups, which are adapted to that particular environment. The climate and geography of a region determines what type of biome can exist in that region. Major biomes include deserts, forests, grasslands, tundra, and several types of aquatic environments. Each biome consists of many ecosystems whose communities have adapted to the small differences in climate and the environment inside the biome (www.blueplanetbiomes.org/world_biomes.htm). Sometimes I make reference to "climate" zones. Climate classification systems are ways of classifying the world's climates. A climate classification may correlate closely with a biome category, as climate is a major influence on biological life in a region. The most popular classification scheme is probably the Köppen climate classification scheme. Sometimes I mix up these two terms; sometimes I interchange them. In general, the climate in Russia ranges dramatically, from "sub-tropical" along the Black Sea coast to "Arctic" along the Arctic Ocean coast. Most of Russia experiences a continental climate with taiga as the predominant biome. Flash Map of the Geography of Russia (this will open in an new browser window, recquires the Flash plug-in)--not yet available. 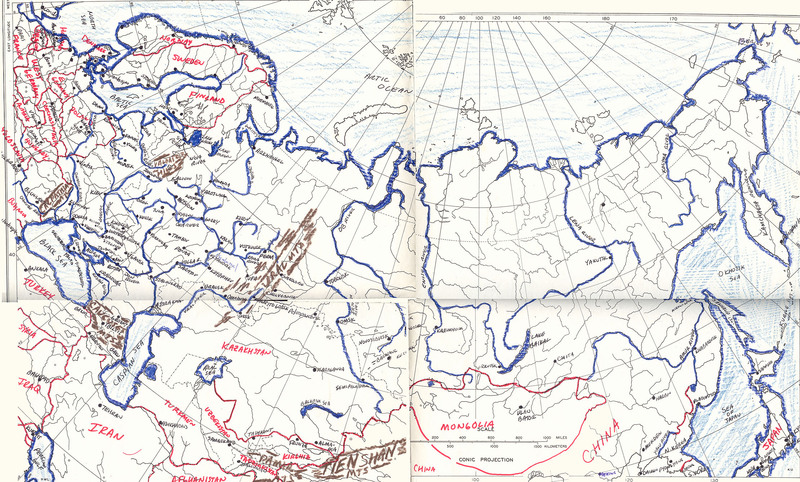 I also have links to some other online map resources that are useful in the Russian history courses, and I have available my old study map of Russia, which I have scaled down from the original size of about 18x28". Finally, I have some short audio remarks (*.mp3 format) of about five minutes on Russian geography--I had some difficulty recording those remarks so bear with me on the quality! 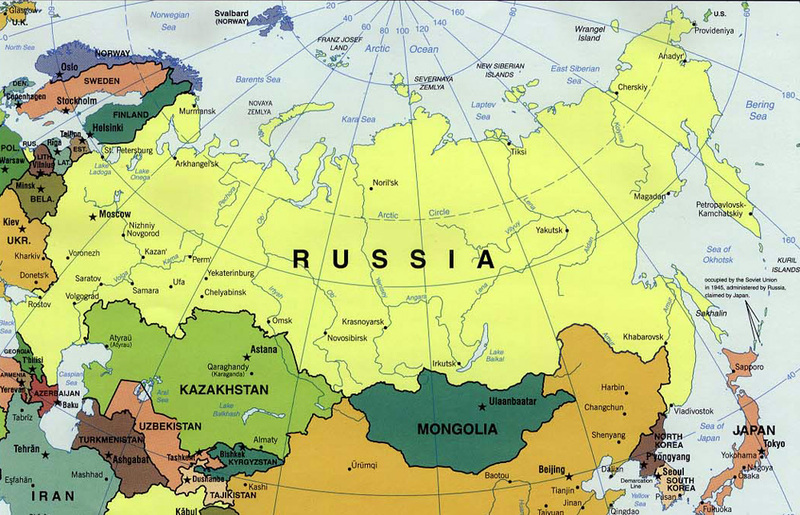 A more accurate, recent political map of Russia which shows the now-independent countries of the former Soviet Union.